Perpetual melodic death stalwarts Omnium Gatherum have been putting in their dues for quite some time. Nowadays, they seem to be regularly referred to as one of the strongest acts in the genre, but for a while there, it seems they were doomed to a status of ‘underappreciated.’ But the last 10 years have seen them skyrocketing in favor, due to a sound that captures melancholy as well as it does upbeat aggression. Something that the band’s upcoming release, The Burning Cold, exemplifies. Some of the band’s finest work to date, it never waivers from their vision of melodic death metal, yet the melodies and subtleties within give it some added range and power. 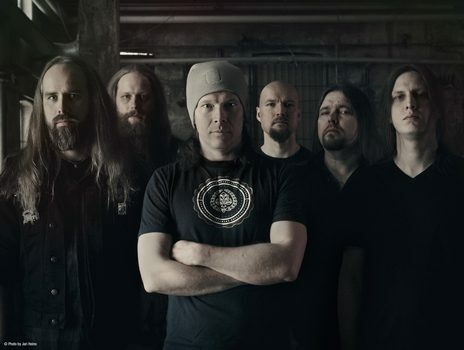 Jukka Pelkonen spoke with us about said album, what he and the band have learned over the years, and their relationship with Dan Swano. Dead Rhetoric: What’s it like seeing all of the years of hard work paying off and having the band becoming much more prominent in the global metal scene? Jukka Pelkonen: I think the thing is, that we love this thing so much that we don’t mind the hard work at all. Sometimes it can be a bit stressful but I would think that would be the same for any profession. Sometimes it feels better and sometimes it’s more challenging. I think the constant touring has been affecting it. We love to play live, and we have been doing it a lot for the past few years. I think that’s why we are getting acknowledged more. Nowadays, people are really enjoying bands that do tour, and not just release albums. We have a couple of years ahead of us before we all turn into old men [laughs], so we have to do it now! Dead Rhetoric: That being said, the band has been quite active in the US in the past few years. Do you see yourselves finding gaining a bit of a foothold over here? A lot of times, with European bands, it takes a real big push to make some inroads here. Pelkonen: That is exactly right. I think we have a steady and growing following in the US. That’s actually due to the fact that we have been touring their actively since 2014. We have been touring with different kinds of bands – we toured with Dark Tranquillity, Sonata Arctica, and Insomnium – so there have been different types of crowds. So different kinds of people get to hear us play live, and then maybe get to know our band better. The next tour is going to be, at least in my opinion, the best one yet because the line-up is really amazing. Dead Rhetoric: How would you say that the band’s songwriting has evolved in the last few albums? Where does The Burning Cold sit? Pelkonen: I think for us, it’s really important to keep things fresh in a way. We have a certain style, which is melodic death metal with a twist here and there with some progressive elements and AOR. I think we have been going into that direction more and more. Except that for Grey Heavens, which was a bit darker of an album if you compare it to New World Shadows or Beyond. I think The Burning Cold is more like those albums, if you compare it to the older material. But I think the evolution of our composition has been a steady growth of identifying and redefining our style. I think The Burning Cold really represents this whole process of what kind of music we aspire to make. It’s been a long road, but it’s been totally worth it. I really, really love this new album. Not just because it’s our new album but I think the songs go together well. I think the whole album is quite well planned in a way. The songs that follow each other – we couldn’t have come up with a better framework for the album. I think we are at that point – we are hungry for playing these songs live for the next two years or so. We are going to start composing new material within a year I would say. This is the direction that we want to be going in. Dead Rhetoric: There seems to be a lot aggression, yet the melodies always sharply contrast them. Do you think this duality defines what Omnium Gatherum usually does? Pelkonen: Yes, I would say that it definitely is. I would say it’s a marriage between the harshness of the death metal style, and for example, the AOR-styled melodies and keyboards. It’s one of the things that we have been aiming to do over the past few years. We have succeeded in creating this atmosphere that sounds like it’s raining but the sun is shining at the same time. This is really the direction that we want to continue it – it’s so enjoyable for us as artists, to have variety within the songs themselves and of course, with the songs [overall]. We do have a straight line in the style that we follow, but there’s always some spices here and there to add to keep it interesting and have some depth. I think it has served our listeners as well. These little elements that we add to the songs really give particular songs more space and you don’t get so bored with the songs as easily. I would say that’s one reason that we are doing the style that we are doing. Dead Rhetoric: It’s almost like that at this point, you have your style and you’ve gotten so honed into it that you can add these tweaks to make it better while sounding like Omnium Gatherum. Pelkonen: Exactly, and this has been our goal since maybe 2010, after The Redshift. We decided that we were going to have a certain style but keep things fresh. It’s really important to us. I don’t want to fall asleep on stage with boring, lousy songs [laughs]. Dead Rhetoric: Could you talk a little bit about the lyrical content of The Burning Cold? Pelkonen: For me, the themes that appear on our albums are really personal. I try to make those kinds of stories and lyrics that are really important to me at that point in time. Self-reflection is one of my constant themes that I’ve been adding to the lyrics for years now. With The Burning Cold, it’s more in your face – there’s a lot of criticism of the chaotic points of war, the war that is happening inside of people and the war that we see in the world for different reasons. There’s a few songs, like “The Frontline” and “Over the Battlefield,” where there are no mystic layers and it’s more of a straight-forward criticism. But there are also songs about motivation, and how you keep that motivation. “Driven By Conflict” is one that is all about the motivation that one must have to be able to achieve the things that one wants to do. It’s also about those kind of mental stages and emotional clashes that we have we have with each other and how we react to different kinds of critical situations. Why do we laugh at some things more than others? Why are some things more easily left behind than others? Why do we have constant fear in our existence, for those things that are not so familiar to us? Is it because at the deepest level, that people are afraid of losing their own existence? Fear of death is a really defining thing, and it can be found behind so many traumas and stresses that people have. People don’t seem to realize it, and this is one of the things that I try to think about in the lyrics of The Burning Cold. But basically, those kinds of things were on my mind when I was constructing these new stories. But I also must say, that each and everyone who reads and listens to the lyrics are entitled to get their own messages from the songs. These are just my opinions about them, that’s all. Dead Rhetoric: What can you say about Dan Swano’s relationship with the band, as he’s been involved with the production for a number of albums? Is he more or less a member of the band at this point? Pelkonen: Yeah, we have worked with Dan since The Redshift, so it’s been 10 years now. Also Teemu Aalto, who is also one of our producers and a recording guy – we have worked with him for a long time now. Both of those guys are really professional, and in a way that they feel like they are a part of the group. We have such an excellent dialogue when we are making albums with them. No one is afraid to say things in a straight-forward way. That is a reason that we have been able to keep the standards that we want to. The feedback that you get, in both directions, is really important. You need a good working relationship to get a good album with good sound. In that sense, it seems like Teemu and Dan are both band members. One day, we would really like to invite them onstage with us. We’ve been asking Dan – we’ve seen him a couple of times in Germany. I think he lives there now, and he’s been coming to our gigs, so I ask him to sing “New World Shadows” with us but he’s a bit shy in that sense. He’s like, “No, I’ll just ruin the whole night.” So I say, “C’mon Dan! One song man, one song!” But I totally respect the fact that he chooses not to. Maybe one day – I’m not going to give up. But yeah, both of those guys are like members of this fine group. Dead Rhetoric: You’ve been in the band for over 10 years now, what do you feel the band has learned from having to move from label to label on a number of occasions? Pelkonen: A couple of things. For one, style-wise, the music has become more sensible in a way. Experience-wise, a lot of things have happened. We are not so naïve in considering touring and record deals – those kinds of things that go along with the music industry that isn’t the dream industry that it’s advertised to be. So I think we are less naïve than we used to be. We have been around so long; we know what to do and what not to do. There have been some tough lessons here and there, but there’s no way we are going to end this thing now. No matter what you do, or no matter what your goals and ambitions are, there’s bound to be some challenges along the way. I would say that growing up to understand what makes the industry ticks is something we’ve learned over the years. Dead Rhetoric: What are some of the personal highlights that you have experienced in the band? Pelkonen: To be able to see those places that we have been, in the US, or Japan, or in France. Seeing different people and places is a constant highlight for me. I’m not a big tourist-y type of guy that I go to different spots when I’m in a location, I just enjoy the atmosphere and talking to the local people. Of course, the shows in general, they are always the best thing. This is what we came to do. If people are enjoying it and we have moshpits and things like that, it’s most important to me – they get their money’s worth and we have a good night together. People can draw strings to their everyday lives with these types of experiences. When fans come up to me and say that this or that song made a big difference to them, or got them through a hard time in their life, those are the real highlights. I know I’ve done something right. 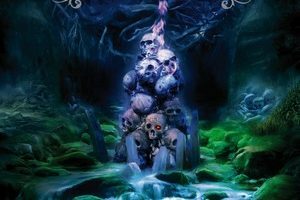 Dead Rhetoric: What do you see as the contribution that you’ve made to the melodic death metal genre? Pelkonen: I think the contribution that we make to the whole genre is that we keep the death metal traditions alive, but we always try to bring something new and fresh to the equation. Not just to write melodic death metal, but to write quality melodic death metal that really interests ourselves. We want to make the kinds of songs that we are interested in. I think the perspective we are offering is that you can be an aggressive melodic death metal band, and add those sort of things that we do in to the music and into the songs themselves. For those starting musicians, if they are going in that sort of direction at all, they get reassurance that this can be done. You don’t have to follow all the rules, you can have basic structures otherwise it wouldn’t be melodic death metal, but you can take a trip to the wild side on the way. If you want to play pure, progressive music than that’s something different altogether, but I think that we’ve shown to the genre that there can be, and we are not the only one’s that are doing this, but the songs can be quite simple while having a real depth and different layers to them. Dead Rhetoric: What else is in the works outside of the upcoming Amorphis/Dark Tranquillity tour? Pelkonen: After we come back from that tour, we are going to do a couple of gigs in Finland. Then we will hit Europe with Wolfheart. They are fun guys and a pretty decent band also. After that, we will have a bit of a Christmas break but I think we will continue touring. We have some cruises confirmed – not the 70K but something similar. But we’ll do a lot of touring, and maybe a couple more music videos. We are keeping as busy as possible, because it’s going to be really awesome to finally play these new songs. There’s nothing wrong with the old songs, but its nice to have some more variety. The last two years has been Grey Heavens, Grey Heavens, and Grey Heavens. I think we’ll have some fun with you guys live.